March 25th, 26th and 27th myself along with Sharon Preston, Linda Hanson and Sheila Larson of the Ladies of Lead Group Therapy LLC. attended the NRA Instructor Certification Course, Refuse to be a Victim Instructor Course and Basic Pistol Instructor Course. As new graduates, we are all now qualified to teach the NRA Refuse to be a Victim and Basic Pistol Course. Within the NRA Basic Pistol Shooting Course, attendees are allowed the opportunity to learn about various pistols, cartridges, bullets and shooting positions. 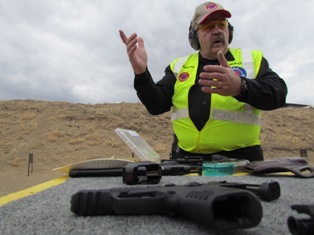 There is 8 hours of classroom instruction followed by 4 hours of range time. Within the Refuse to be a Victim, attendees will learn to have an overall personal safety strategy in place, before it is needed. With topics covered including home security, personal security, automobile security, workplace security, and technological security. For additional information contact Sharon Preston at Ladies of Lead, Group Therapy LLC at 541.788.5858 or www.lolgrouptherapy.com .